ASUS equipped the Maximus VIII Gene with six angled SATA ports. All ports offer 6Gbps bandwidth and all six SATA III ports are natively wired to the Z170 PCH. Furthermore four SATA ports can be combined to two SATA connectors. This board offers two full-sized PCIe Gen 3 slots, where the first one has been wired using 16 lanes and the second one features eight lanes. Inbetween the two full-size PCI-Express slots there is an M.2 slot which has been connected to the PCH via four PCI-Express Gen 3 lanes offering a total of 32 Gbps bandwidth. You'll also find practical onboard power- and reset-buttons on this board and there is also a debug display. 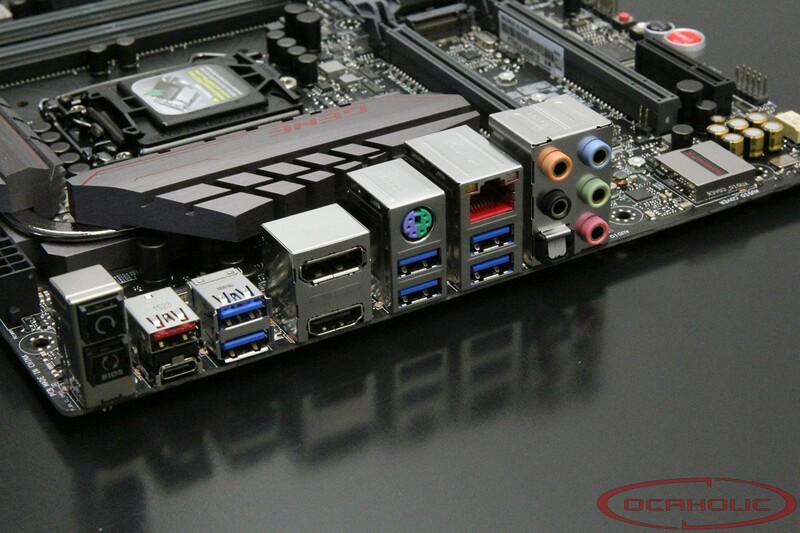 ASUS equipped this board with their latest SupremeFX audio solution. Also on this version of ASUS' SupremeFX audio solution there are high quality Nichicon capacitors as well as an ES9023P DAC. There is a total of seven fan header on the Maximus VIII Gene which is more than enough, to provide a well equipped mATX system with fresh air. The fan header are located around the CPU socket as spread over the motherboard. ASUS decided to use 4-pin PWM headers in all seven cases. Therefore it is possible to adjust rotation speed in the BIOS or in Windows. One of the headers is marked "W-Pump", which offers a greater control range in order to better adjust pump speeds of all-in-one water pumps. Looking at the external connectors directly at the back-panel ASUS equipped the Maximus VIII Gene with a PS/2 port, seven USB 3.1 Type-A ports and one Type-C port, one gigabit ethernet port, an HDMI and a DisplayPort connector as well as an optical out and an analogue audio panel. Furtheremore you'll find also a clear CMOS button and a ROG Connect switch.